Once a microorganism has been isolated and grown in pure culture, it becomes necessary to maintain the viability and purity of the microorganism by keeping the pure culture free from contamination. Normally in laboratories, the pure cultures are transferred periodically onto or into a fresh medium (subculturing) to allow continuous growth and viability of microorganisms. The transfer is always subject to aseptic conditions to avoid contamination. Since repeated subculturing is time consuming, it becomes difficult to maintain a large number of pure cultures successfully for a long time. In addition, there is a risk of genetic changes as well as contamination. Therefore, it is now being replaced by some modern methods that do not need frequent subculturing. These methods include refrigeration, paraffin method, cryopreservation, and lyophilization (freeze drying). Strains can be maintained by periodically preparing a fresh culture from the previous stock culture. The culture medium, the storage temperature, and the time interval at which the transfers are made vary with the species and must be ascertained beforehand. The temperature and the type of medium chosen should support a slow rather than a rapid rate of growth so that the time interval between transfers can be as long as possible. Many of the more common heterotrophs remain viable for several weeks or months on a medium like Nutrient Agar. The transfer method has the disadvantage of failing to prevent changes in the characteristics of a strain due to the development of variants and mutants. Pure cultures can be successfully stored at 0-4°C either in refrigerators or in cold-rooms. This method is applied for short duration (2-3 weeks for bacteria and 3-4 months for fungi) because the metabolic activities of the microorganisms are greatly slowed down but not stopped. Thus their growth continue slowly, nutrients are utilized and waste products released in medium. This results in, finally, the death of the microbes after sometime. This is a simple and most economical method of maintaining pure cultures of bacteria and fungi. In this method, sterile liquid paraffin is poured over the slant (slope) of culture and stored upright at room temperature. The layer of paraffin ensures anaerobic conditions and prevents dehydration of the medium. This condition helps microorganisms or pure culture to remain in a dormant state and, therefore, the culture can be preserved form months to years (varies with species). The advantage of this method is that we can remove some of the growth under the oil with a transfer needle, inoculate a fresh medium, and still preserve the original culture. The simplicity of the method makes it attractive, but changes in the characteristics of a strain can still occur. 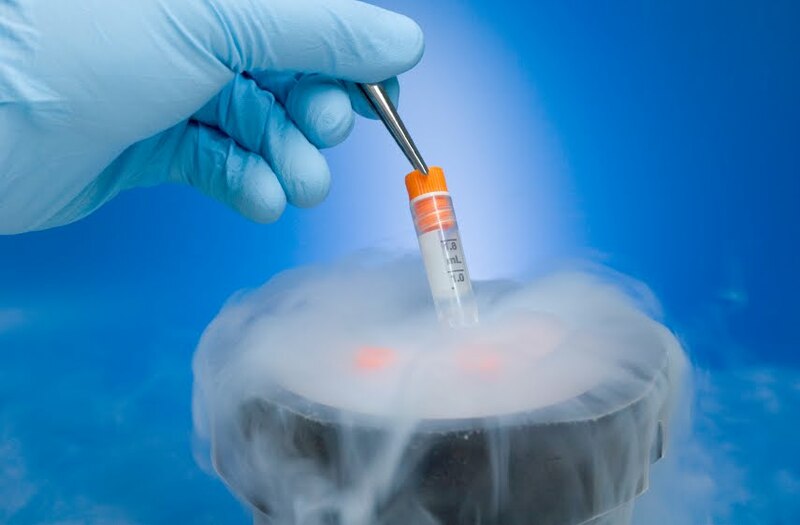 Cryopreservation (i.e., freezing in liquid nitrogen at -196°C or in the gas phase above the liquid nitrogen at -150°C) helps survival of pure cultures for long storage times. In this method, the microorganisms of culture are rapidly frozen in liquid nitrogen at -196°C in the presence of stabilizing agents such as glycerol or Dimethyl Sulfoxide (DMSO) that prevent the cell damage due to formation of ice crystals and promote cell survival. This liquid nitrogen method has been successful with many species that cannot be preserved by lyophilization and most species can remain viable under these conditions for 10 to 30 years without undergoing change in their characteristics, however this method is expensive. Freeze-drying is a process where water and other solvents are removed from a frozen product via sublimation. Sublimation occurs when a frozen liquid goes directly to a gaseous state without entering a liquid phase. It is recommended using slow rates of cooling, as this will result in the formation of vertical ice crystal structures, thus allowing for more efficient water sublimation from the frozen product. Freeze-dried products are hygroscopic and must be protected from moisture during storage. Under these conditions, the microbial cells are dehydrated and their metabolic activities are stopped; as a result, the microbes go into dormant state and retain viability for years. Lyophilized or freeze-dried pure cultures and then sealed and stored in the dark at 4°C in refrigerators. Freeze-drying method is the most frequently used technique by culture collection centers. Many species of bacteria preserved by this method have remained viable and unchanged in their characteristics for more than 30 years. Only minimal storage space is required; hundreds of lyophilized cultures can be stored in a small area. Small vials can be sent conveniently through the mail to other microbiology laboratories when packaged in a special sealed mailing containers. Lyophilized cultures can be revived by opening the vials, adding liquid medium, and transferring the rehydrated culture to a suitable growth medium. Are humidity important for microbial maintenance? can the stock freeze in home refrigerator? Sahar, its not a good idea to put bacterial culture in your refrigerator which is used for your domestic purpose. Remember two most important task of preservation of stock culture are 1. maintaining viability 2. maintaining purity (preventing mutation). So for longer storage liquid nitrogen and lyphilization are used, but for cultures which you use daily or weekly, you can refrigerate the stock culture for shorter duration without losing viability. But the 4 process of lyophilization is not mentioned.